It's been quite some time since I leapt from a cliff and soared through the clouds on the back of a Toruk. But it's every bit as exhilarating today as it was when I first took the plunge in 2009. Back then, James Cameron's Avatar was a 3D cinema sensation, but that dimensional euphoria has been hard to recreate of late. These days stereoscopic hardware is even rarer than Unobtanium. Still, things are looking up. Optoma's low-cost 4K beamer, the UHD51, is part of a new generation to offer 3D compatibility, albeit in 1080p. And it turns out this projector is a grand reminder of just how much fun bigscreen 3D can be. My return to Pandora has left me thrilled and dizzy with delight. Design wise, the UHD51 should be easy to accommodate. It's smart and compact, and relatively light too, at 5.22kg, so ideal if you want to install it on a shelf or ceiling mount. The cabinet is gloss black, with a silver trim that wraps around the body. The lens, which is slightly offset, has a matching silver surround. Rear connections comprise two HDMI inputs, both of which are 4K-capable with HDCP 2.2 support. There's also a PC VGA port, audio minijack in/out and optical digital audio output. A USB port can be used to power an HDMI dongle/streamer, should you want to pop one in one of the HDMI inputs. Control options include RJ45, RS-232 and a 12V trigger, the latter useful for integrating a motorised screen. The UHD51 sports its own, relatively modest, internal 5W sound system. While useful for impromptu sessions, it's neither Hi nor Fi. 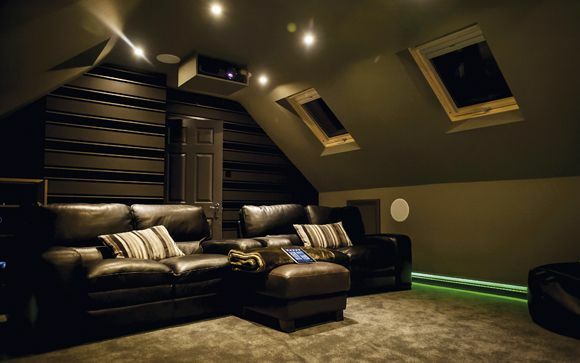 For movie playback you'll certainly want to turn it off in favour of a dedicated surround system. It's an easy PJ to get to grips with. Optoma offers a great-looking graphical interface, and there's an internal test pattern generator to ensure sharpness and linearity. Zoom and lens shift (vertical) are managed manually via an adjustment atop the lens. An alternate costlier model, the Optoma UHD51A, adds Alexa control functionality to the package. A SmartProjection Smart Home allows owners to power the projector on and off and select input sources without having to lift a finger. There's a variety of SDR viewing presets (Cinema, HDR Sim, Game, Reference, Bright and User) but to be honest there's not a huge amount of difference between them, certainly compared to the differences you might see between presets on a TV display. With Blu-ray/TV content the Cinema mode became my go-to default, and it's actually quite atypical for a Cinema mode, being punchy, with clean, uncoloured whites and excellent colour. The projector is compatible with HDR10 content. Compliance can be set to Auto or turned off completely. You might want to do the latter if you find an HDR image dims unacceptably. When given an HDR signal, the UHD51 locks to a single HDR display mode. It had no problem accepting a 10-bit 2160p output from a Sky Q set-top box. I used this and a Panasonic DMP-UB900 UHD Blu-ray player for the bulk of the audition. The UHD51's lamp brightness has just two settings, Eco and Bright. The former extends the life of the lamp to a claimed 10,000 hours, but more significantly drops the operating noise of the projector down. There is a visual consequence though. Watching animated sequel Kung Fu Panda 2 (BBC Two HD), the white feathers of Master Crane lose a little of their luminance when you switch to Eco. The picture still has a high level of 'snap', though, and you probably wouldn't notice the difference without an A/B comparison. This is just as well, because in its Bright mode the UHD51 is actually quite noisy; Optoma quotes 25dB, but it sounds louder. Switch to Eco and fan noise drops to a whisper. Unfortunately, the tone of the spinning DLP colour wheel is distinct and unwavering. It's like a pronounced buzz, which is a bit disappointing. I've no doubt that most cinephiles will mask this with serious audio (although you'll not escape it if you're screening A Quiet Place). The PJ's XPR (eXpanded Pixel Resolution) 0.47in DMD device is partnered with a six-segment RGBRGB colour wheel that covers 100 per cent of the REC.709 colour space. This unit doesn't therefore support wide colour as used on UHD Blu-rays, instead downconverting to the standard currently embraced by TV and vanilla Blu-ray. And this isn't a major issue. The palette of the aforementioned Kung Fu Panda movie, within a REC.709 container, is ferociously lush. A journey by our rotund hero into a perilous pagoda is bathed in all shades of red, but the image is never noisy. Colour production can be tweaked via Optoma's colour management suite. Brilliant Color processing is adjustable between 1 and 10; D65 is the default colour temperature, but you can scale up or down from this point. The colour gamut itself is variable between Native, HDTV, Presentation, Cinema and Game. Native is the best bet. You can also tweak RGB gain and bias, although this shouldn't be considered a user setting. DLP's trademark clarity is evident in both HD and Ultra HD sources. Its pin-sharp accuracy is superb. Refreshingly, I didn't experience any rainbow flicker, DLP's old nemesis, either. I found the picture smooth and coherent, and largely immune from contrast-induced artefacts. There's been some debate about the validity of DLP's 4K presentation given the flippy nature of the tech, yet the projector actually does an excellent job presenting ultra-fine detail from a UHD 2160/23.976 test pattern. All graticules exhibit detail, although there is a flicker or 'fidget' on the bars, presumably a cumulative result of the mirror switching tech. For raw detail and naturalistic texture, the gritty North London drama Save Me (Sky Atlantic 4K) has much to offer. The forlorn inner-city estate exhibits a wealth of detail, and there's a preponderance of emotive close-ups to convey the drama. The imagery is quite striking. Black level performance is good enough. It's probably unreasonable to expect a low-cost projector like this to be able to differentiate the same level of shadow detail as an OLED screen, but it certainly has no problem differentiating between 0 and 10 per cent black on a greyscale. Use of the supplied Dynamic Black tool is largely down to taste. I preferred it Off on this model, however some might like the denser blacks it produces. The UHD51's HDR handling is rather good. Playing Transformers: Revenge of the Fallen (Ultra HD Blu-ray), wherein Shia LaBeouf's car is airjacked and then rescued by Autobots (Chapter 9), rewards with a nice sense of dynamism. This PJ doesn't mute the image in an attempt to fake highlights; sparks and explosions generate genuine peaks. The Optimus Prime forest face-off also provides a stunning example of the blistering clarity the UHD51 is capable of. When Prime falls and his victor's eyes glow deep red, it's difficult not to splutter with AV satisfaction. It performs well with SDR too. As Spidey foils the faux-Avengers bank robbery in Spider-Man: Homecoming (Sky Cinema UHD), alien weaponry crackles with luscious luminosity, and later, when Peter scales the Washington Monument, the detail in the brickwork and his suit is crisp and obvious. VFX seams are nowhere to be seen. Image smoothing is offered in the form of PureMotion processing. This is actually quite benign in operation (which is a good thing), and irons out horizontal panning judder. I'd recommend keeping PureMotion Low for movies and TV content, but experimenting with High for sports. And then there's the surprise star turn. Optoma's UHD51 will project 3D in 1080p with a 144Hz refresh rate – and it looks glorious. 3D images exhibit extreme depth with minimal crosstalk. Unsurprisingly, there are no 3D glasses supplied, so you'll need to invest in a pair of Optoma's ZD302 DLPLink spex. But it's worth the expense. The projector does an excellent job boosting brightness to compensate for these shuttering specs, thereby maintaining contrast and colour vibrancy. The menu for Disney's Tangled 3D, which features a plethora of airborne lanterns, looks invitingly deep, with each lantern tightly defined. Tangled's 'Meet Jack Ryder' sequence, in which the scoundrel flees pursuing horse-mounted assailants, enjoys grin-inducing dimensionality. Note that with 3D content, the projector locks to a 3D display mode. You don't get to choose from any other image preset. Brilliantly priced, a rock-solid performer and with just enough setup flexibility not to make installation a chore, Optoma's UHD51 certainly shakes up the home cinema projection market. 4K UHD has unapologetically relegated Full HD to the cheap seats, and offers a level of performance that would frankly have been unthinkable for the price even a few months ago. It's well appointed, capable of extreme clarity and even makes 3D fun again. Perhaps it's finally time for HD home cinephiles to upgrade? We say: Optoma doesn't cut corners with this entry-level UHD hero. Images are sharp, colour rich and dynamic, and there's the bonus of fine-looking 3D.